Sessions will be a mixture of indoor and outdoor activities. All attendees need to bring a drink and appropriate outdoor protection for the weather. 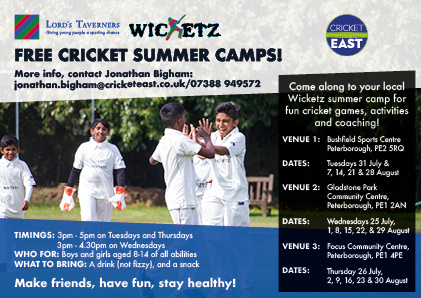 To register a place, call Jonathan Bigham, Wicketz Development Officer on 07388 949 572 or 01480 273069. Further details HERE.